What if your phone could directly read the temperature instead of relying on distant weather stations? It turns out Android phones can, in a bit of a roundabout way. 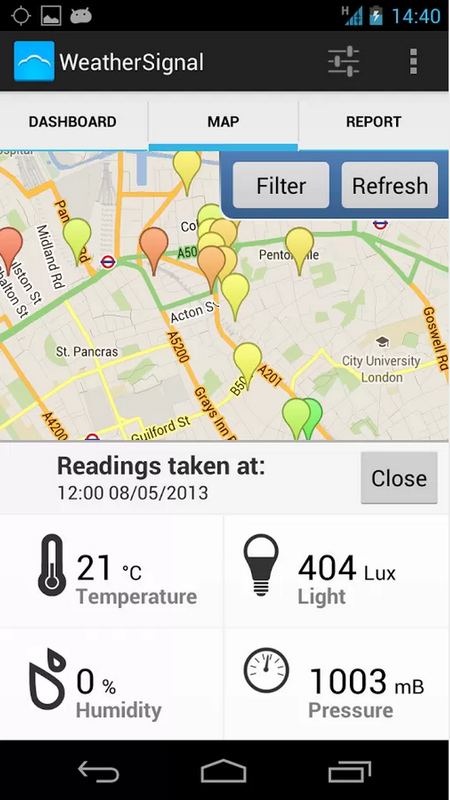 The WeatherSignal app crowdsources weather with the temperature sensors built into the batteries of Android-compatible phones. iPhone users can’t provide data, but they can use the app. Since its launch three months ago, researchers and the OpenSignal team behind the app have been monitoring its effectiveness. They found that in six major cities the app is accurate to within an average of 2.7 degrees. They published their work today in Geophysical Research Letters (subscription required). The app works by comparing a battery’s current temperature to its normal temperature, which can be used to infer the environment surrounding the phone. Other factors can come into play though, such as running an energy-intensive game that causes a phone to heat up. To minimize error in temperature readings due to factors like these, WeatherSignal needs lots of phones submitting weather data that can then be averaged. WeatherSignal’s accuracy is still hurt by a relatively low number of users. The six cities OpenSignal used to determine the app’s accuracy have an above average number of people submitting data, which means temperature readings are more likely to be more than 2.7 degrees off in other cities. Cofounder James Robinson said in a release that as the number of users grows, OpenSignal will need to fine tune readings in currently underserved cities based on weather station data. There are only around three people providing data in San Francisco. Hopefully the number increases in the future, as the city’s microclimate-stricken citizens could use an app like this. Since most phones aren’t outdoors, then I don’t see how this will help with the weather prediction. Most peoples phones are in a climate controlled environment. At best, you would be averaging the indoor temperatures of these phones. Additionally, how do battery temperature ratings vary when a phone is being charged? Do they vary with the type of charger (fast car charging, or slow wall charging) being used? What about the age of a battery? Seems like the battery is the least reliable sensor system to use, especially as the battery systems go through various charge / de-charge cycles, and their cells are affected by those cycles. This seems like a fad or flash idea, phones are not equip with proper sensors throughout.. the battery is not a good indication of ambient temp. I use it and its hardly accurate. The pressure readings never change and the spelling in the help windows is atrocious. Not giving up on it though. Its a good concept and has the potential to work as the sensor readings improve. My god Signe, your past math teachers must hate you: 2.7 degrees is repeated several times, not once with a unit!! 2.7 degrees Fahrenheit? Celsius? Kelvin? Rankine?! Someone who claims her focuses to be “science and technology” should know ALL measurements are be cited with their correct units, NO exceptions!! Nice! But I keep my phone mostly indoors or in a pocket or purse or car. Seems like this app is more about guessing than accuracy. And each model phone has its own temperature profile. I give it an A for amusement and an F for usefulness. Curious how outdoor temperatures would work, specially in extreme/ wet conditions ? Body heat factors? I don’t know many people who expose their smart phones to outdoor conditions. Any implication on battery life on participants cell phones? Thank you Signe for the article. It seems a very useful app for users. It will help that users whose work are get affected by weather change easily. Thank you again for sharing information about this app.